You’ve probably noticed the ever-changing landscape of mobile health, or mHealth. More and more patients are looking for some form of mobile care to supplement traditional office visits. Continued advancements in mHealth are allowing healthcare providers like you to care for patients more effectively than ever before. Numerous new mHealth apps have hit the market over the past few years, but here are three you’ll want to take note of. 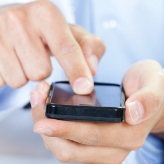 Want to know which mHealth applications are making life easier for healthcare providers? Here are three HIPAA-compliant apps that have changed the way you can provide care to your patients. This New York-based company has helped transform how doctors and patients handle asthma. Cohero provides inhaler sensors that let doctors know when patients are using their respiratory medication, as well as how they are responding to their medication in real time. The technology gives medical professionals the ability to measure lung function metrics with the same precision they can in the office. Cohero Health also has an app that lets users better understand what triggers their attacks, and provides other information patients can use while not under the direct supervision of their doctor. The result is comprehensive asthma care at all times, allowing doctors and patients to always remain informed. Known as the digital clinic for women, Maven lets healthcare professionals from all backgrounds – including MDs, nurse practitioners and dietitians – connect directly with female patients. Users schedule an appointment with the healthcare professional of their choice, and then meet via a video chat through Maven’s app. Afterwards, the doctor and patient will continue to communicate through the app for post-appointment follow-ups. The objective of the app is to let women consult with medical professionals without having to take time out of their schedule to go to the doctor’s office. The app is also designed to provide an environment in which women feel comfortable. Maven fully vets all potential practitioners, and you must pass a thorough screening process before being allowed to see clients. This app changes how senior care communication and coordination take place by streamlining the entire process. The idea behind Carmerge is to allow care teams at senior facilities, patients and their families to stay connected and informed. The app serves as a hub for data and communication between patient, caregiver, nurses and families. Providers can merge EHRs with Carmerge’s calendar and messaging features, allowing staff to remain organized and families to see how their loved ones are doing in real time. The app also acts as a social network of sorts for those staying in assisted-living or independent-living communities. It allows individuals to communicate with one another, schedule events, and stay-up-to date with what’s happening at their facility. If you are looking for new ways to incorporate technology into your practice, we can help. Our team of IT professionals are experts in healthcare technology and can assist you in finding secure and compliant solutions.